Or the stealthy preparation of beefy mac, a play in three acts. I can’t even front that this meal is remotely authentic in any way. 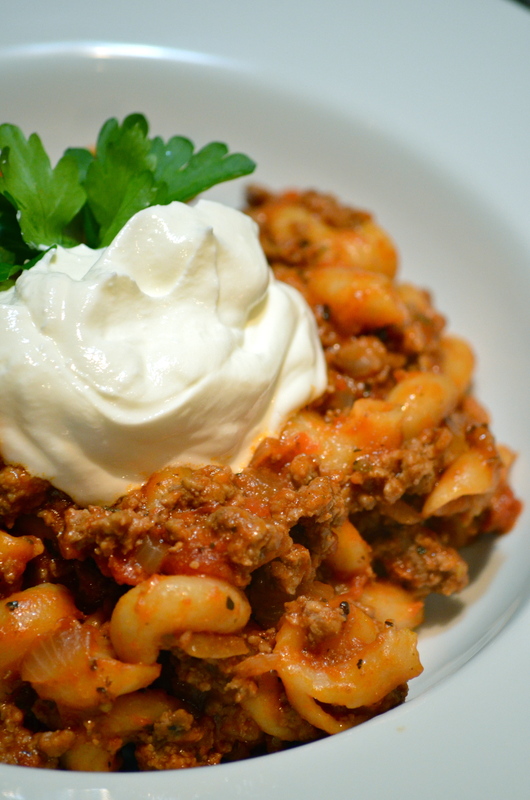 It’s probably more closely related to a box of Lean Cuisine Macaroni and Beef than it is to traditional Hungarian goulash but what do you expect when you base a recipe off something from Bobby Dean, the tilapia of the Food Network. (By the way, I’m not sure what I mean by that other than I think tilapia is a bland cop-out – so I guess that’s what I mean. Sorry Bobby). 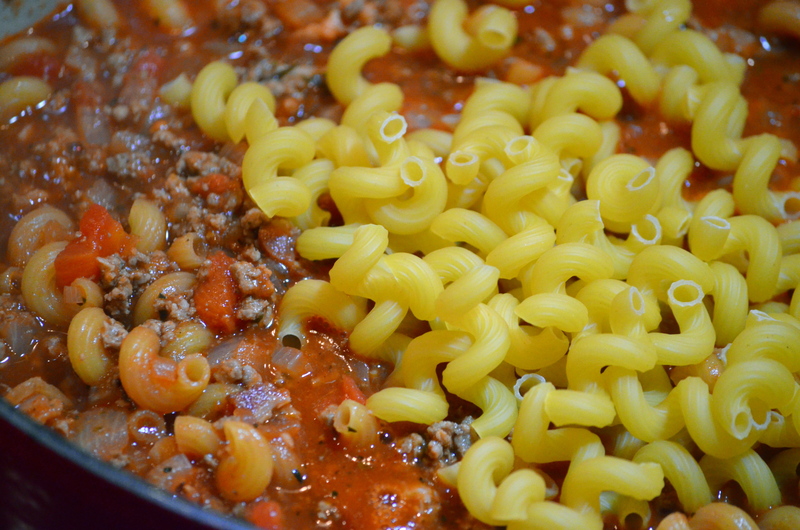 According to Wikipedia, the web’s foremost expert on almost being right, goulash is a soup or stew of meat, noodles and vegetables (especially potato) seasoned with paprika and other spices. Especially potato. This recipe absolutely contains no potatoes but it does have meat, noodles, two vegetables (three if you count bacon) and spices. So you could probably also call it lasagna, chicken noodle soup or fried rice. Don’t get me wrong, it tastes good and it sounds funny – two very important characteristics of a good meal (also see: pu pu platter, kibbeh balls and hot dog). It’s also relatively easy and will feed an entire city block. You may want to half this recipe though since it doesn’t freeze well*. Hindsight being 20/20, I should have. My meats are prepped, the onions diced and the garlic minced. Now comes the bacon which is how many recipes should start. 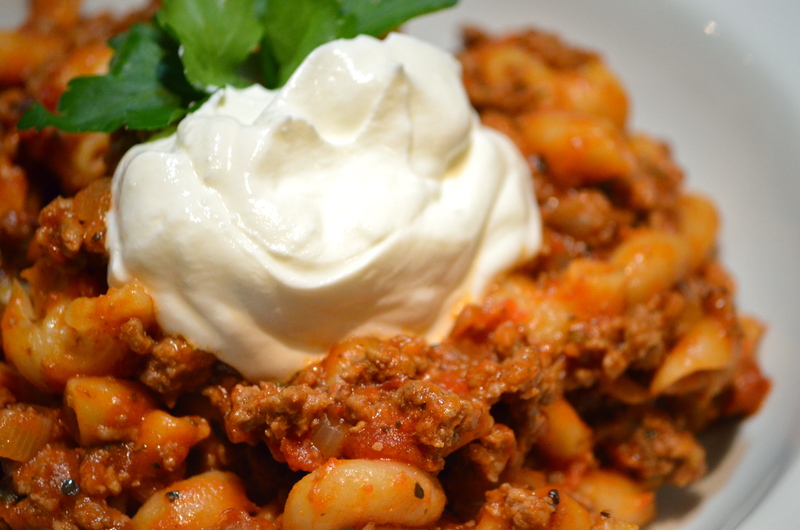 As I said, this recipe is derived from Bobby Dean’s goulash which I found incredibly bland, so I added the bacon, paprika, cumin and sour cream. 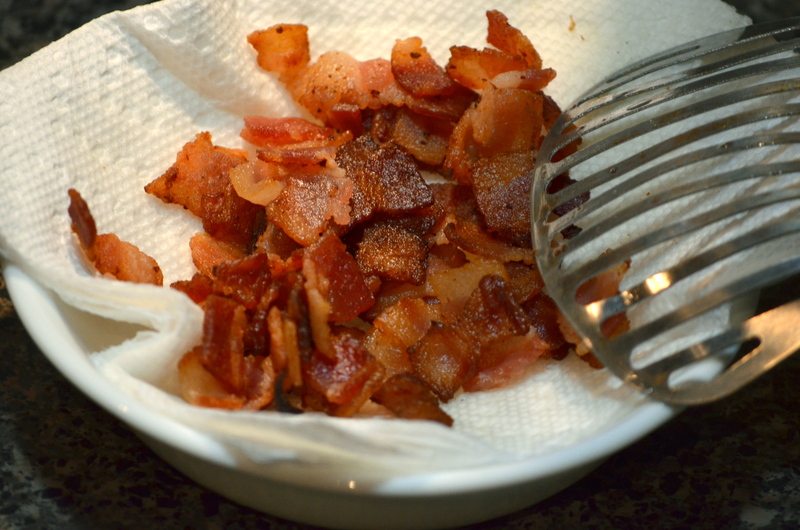 Grab a large pot and cook the bacon until crispy and delicious. Cook an extra piece for you and your pug. Eat as necessary. Now you can saute your onions in the bacon fat as God intended. I will refrain from making you look at another picture of onions in my red Le Creuset. You’ve suffered enough. Once your onions are translucent, add in the meats to brown – you can use any combination of ground turkey and ground beef as you see fit. Speaking of, I feel it’s important to share that my husband got me the most romantic gift any guy could give a gal for Christmas that we will be using tonight (wink wink). It’s a meat grinder attachment for my Kitchen Aid mixer. He really knows the way to my heart. Now go ahead and add everything else into this except the sour cream. Now all that happens is you just cover and simmer this for 20 minutes. After that, pull it off the heat and let the mixture sit for 30 minutes. Then it’s time to eat. As you can see, I used curlicues rather than elbows but I think I like macaroni better. Curlicues are like lipstick on a pig. No need to fancy this up with some gorgeous presentation or garnish. Oh, wait. Oh, you fancy, huh? Obviously. *If you do want to freeze this, stop before you add the noodles and pull out a few servings. 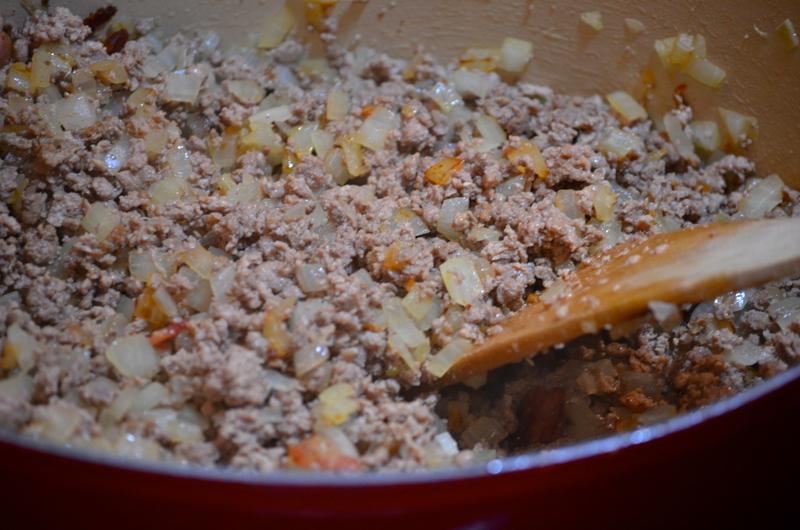 Freeze the meat and sauce mixture and when you’re ready to eat again, thaw it and heat it up adding pasta then. First – how am I suppose to count Bacon as a vegetable? Is there a mysterious process that once Bacon goes through it, it morphs to vegetable? Well, this particular recipe was all about pushing the boundaries of traditions/actual definitions of things. If this is goulash, then bacon is most certainly a vegetable. You don’t really even need the sour cream. I don’t usually put it on mine (I will put Parmesan cheese on it though sometimes). Just be sure to freeze the beef/sauce mixture rather than the whole thing otherwise your noodles will turn to mush/paste/glue. Mmm… mushpasteglue. Whatever you call it, it sounds perfect for these dreary, cold winter nights. I’m making it for my little girls this week for sure! Also made this for Bennitt (17 months). He would have bathed in it if he could-in fact it kind of looked like he bathed in it after he was finished eating. He ate this for a number of different meals and never tired of it. Will be another staple for my young man. I did freeze the leftovers (with pasta), hopefully B isn’t that picky about his pasta textures. That’s pretty much the right audience for most of my food.